Want the 2016 Copa America Centenario Trophy at your house? It’s currently on sale at e-commerce major Ebay at a listed price of $75,000. No, this is not a joke- the trophy is being auctioned by Univision for charity. As per the details in the listing, there are apparently 4 versions of the trophy currently in existence- one with champions Chile (they beat Argentina to claim the title), and the other two with CONMEBOL and CONCACAF. 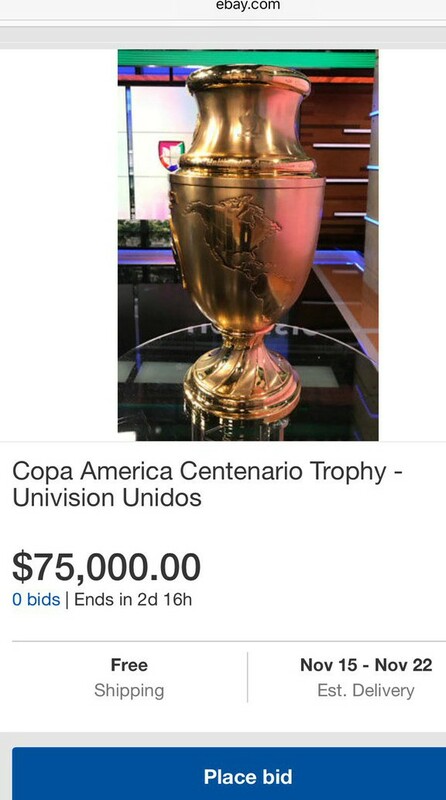 Univision are auctioning their trophy. Check out the pic of the auction below.